“No-one sees the world the same way you do,” a character tells the titular character at one point. And they’re right; whether we like it or not, there’s absolutely no doubt that Steve Jobs is one of the most notable faces that have pioneered and revolutionised how technology and how society functions today. Whether it’s in the form of a laptop, phone or tablet, Apple is not only a cultural milestone but also a home necessity (unless you’re with Windows or Android, in which case we wish you the best of luck), and the person at the very centre of it is, while controversial, a modern-day disciple of the tech world. As we all know, however, not all disciples are completely holy, and thanks to the frankly astounding work done by everyone involved with Steve Jobs, based partially on the official biography by Walter Isaacson, we get to experience something close to what it must have been like to work for such a man – and it must have been rough, if this film is anything to go by. Constantly feeling the wrath of Jobs (portrayed by Michael Fassbender) in the lead-up to three separate product launches – the Macintosh in 1984, the NeXT Cube in 1988, and finally the iMac in 1998 – include, but aren’t limited to, Jobs’ personal confidant Joanna Hoffman (Kate Winslet), his friend and Apple co-founder Steve Wozniak (Seth Rogen), former Apple CEO John Scully (Jeff Daniels), long-suffering team member Andy Hertzfeld (Michael Stuhlbarg) and, perhaps most crucially, his former girlfriend Chrisann Brennan (Katherin Waterston) and his illegitimate daughter Lisa (played at different ages by Perla Haney-Jardine, Ripley Sobo and Makenzie Moss), whom he fiercely denies being his daughter. Each and every one of them have their own personal beefs with Jobs, all of which are teased and drawn out over real-time as he prepares his three respective launches, but all the man himself sees is a line of hurdles blocking his pathway to the glory he seeks. The film’s goal is to mine the very layers of this difficult and complicated man, and see if any traces of humanity lies beneath the hardened surface. 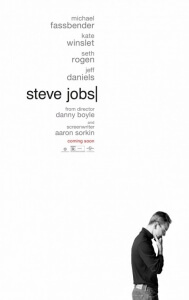 Luckily, everyone from director Danny Boyle to writer Aaron Sorkin to the cast ensemble has brought along the right tools for the job; about as marvellous as any product being launched by Jobs himself, Steve Jobs is an endlessly captivating look at one of the most controversial figures of the tech world, but one that never forgets to examine the man hidden by the monster as well. Boyle, a filmmaker with such a distinct and instantly recognisable style, turns out to be the right man for the job once coveted (and promptly deserted) by David Fincher, keeping everything as tightly strung together as possible while leaving enough room for the heart to beat with all its power. Sorkin, with the second in his now unofficial “tech giant” trilogy after Facebook drama The Social Network – we wouldn’t be surprised if a film about Bill Gates came next, or heck, even the guy who invented Tumblr, there’s gotta be a story in there somewhere – once again has a blast working with his trademark back-and-forth dialogue, producing some seriously stinging zingers along the way, and continuing to be (at least in this reviewer’s eyes) one of the best writers working today in film. Boyle and Sorkin (particularly the latter) clearly dominate here, but their efforts would be nothing without the work of some fantastic actors being lined up to play these parts, many of whom deliver some of their best work as a result. Winslet tackles her meatiest role in years with expected grace and unexpected power, while Sorkin regular Daniels (having recently finished his stint on the short-lived TV show The Newsroom) has some great moments to shine as the underappreciated actor he is, as does Seth Rogen in a rare dramatic role that proves he’s more than just an Apatow fixture. Make no mistake, however; this is Fassbender’s gig all the way through. Awarded a role once sought after by Christian Bale, Leonardo DiCaprio, Tom Cruise and just about every major A-list actor in Hollywood, the fact that the Irish actor looks almost nothing like the real Jobs is highly irrelevant; it’s evident early on that the intent is not to mirror reality exactly as it was, but rather dramatize them in a way that is more accessible to wider audiences (hell, he didn’t even wear his trademark turtleneck and jeans at the real iMac launch as he does in the film). In that sense, Fassbender does one hell of a job presenting a fictional version of the man that is entirely his own; exceedingly arrogant, disillusioned from the things that should matter most, and one hell of a charismatic monster, his Jobs is a fierce and ceaselessly fascinating creation that is bound to rank high amongst the long list of Sorkin anti-heroes, and it is some of the actor’s best work in his relatively short career. Jobs himself passed away over four years ago, but his legacy is simultaneously immortalised and tarnished in one fell swoop by Boyle, Sorkin, Fassbender and co. A rich and layered character study that only these people could bring to life in such overwhelming fashion, Steve Jobs is an absolute must-see for anyone interested in who this man was or may have been, and anyone else who just loves going to the cinema. Steve Jobs is a masterclass of the unconventional biopic (a term we use very lightly here) that is brought to vigorous and compelling life by director Danny Boyle, writer Aaron Sorkin and a fantastic cast led by the overwhelmingly-brilliant Michael Fassbender in the title role. It cannot be highly recommended enough.